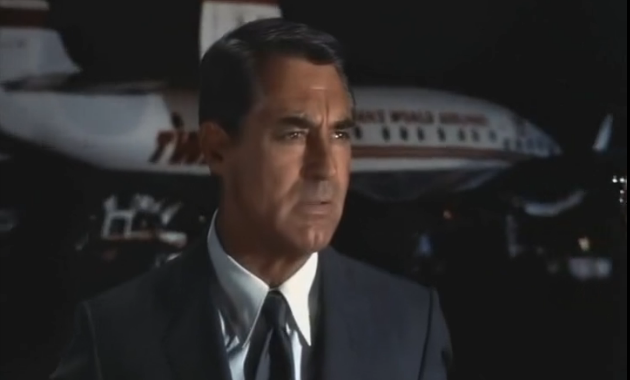 The audience's perspective: North By Northwest and dramatic irony. 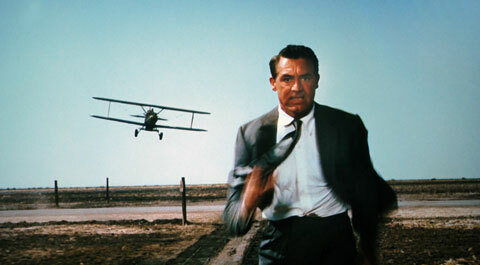 The audience's perspective: Dramatic Irony In Hitchock's North By Northwest. "It all depends on how we look at things, and not how they are in themselves." I don't think it's George Kaplan flying that plane. Note: The theory book itself is available online for free here and is well worth reading, particularly for its examination of the different perspectives and the analogy of story as a battlefield - in which in this particular case, the Objective view is likened to a General on a hill overlooking the battle (story) unfold, seeing various strategies unfold. 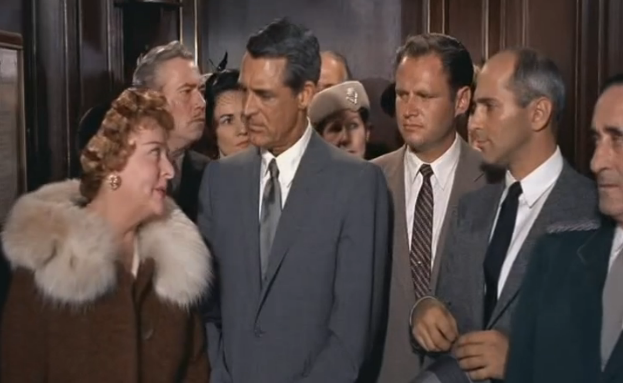 This perspective, accompanied with the other three more intimate looks, gives the audience a complete view of the story and, as we'll examine with Alfred Hitchcock's North By Northwest, allows the audience an opportunity to become all the more engaged through the use of dramatic irony. A literary device, dramatic irony is where an audience is given a piece of information that at least one of the characters in the story is unaware of, resulting in the audience knowing more than one of the characters and placing them one step ahead "in the story." This, in turn, often leads to suspense and ironic humor (often through dialogue), ultimately creating anticipation for the viewer and leaving them wanting to know what happens next. In order to accomplish this, however, the audience needs to have a perspective of the overall story that the character in question does not, hence their awareness of "the bigger picture" from an objective view as seen outside from the characters themselves. As is with much of storytelling, when, why, where, and how the information is parsed throughout the story has a huge impact on audience reception: withhold too much information for too long, an audience's patience may be tested for an understanding of motivation and drive may be lacking. Too much, too soon may result in a similar effect, an audience left frustrated wondering when the characters will catch up. 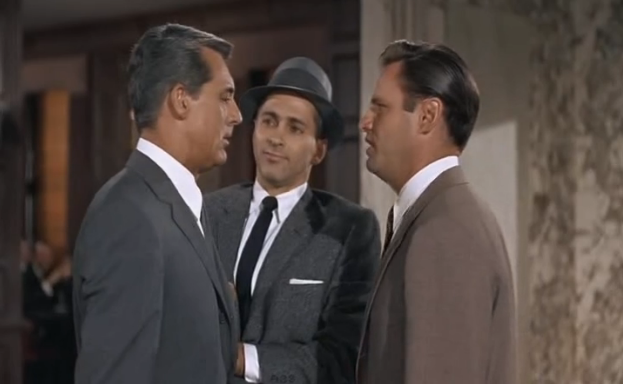 One of the keys to success, as notably demonstrated in North By Northwest, is to continually introduce new information to the audience that other characters aren't aware of. A case of mistaken identity sets the story in motion. 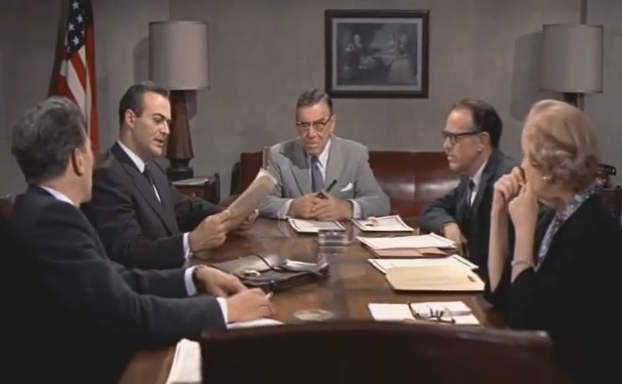 A case of being in the wrong place at the wrong time leads to mistaken identity and kidnapping in Alfred Hitchcock's classic tale when advertising exec Roger Thornhill calls for a porter who, in turn, has a message for one George Kaplan. 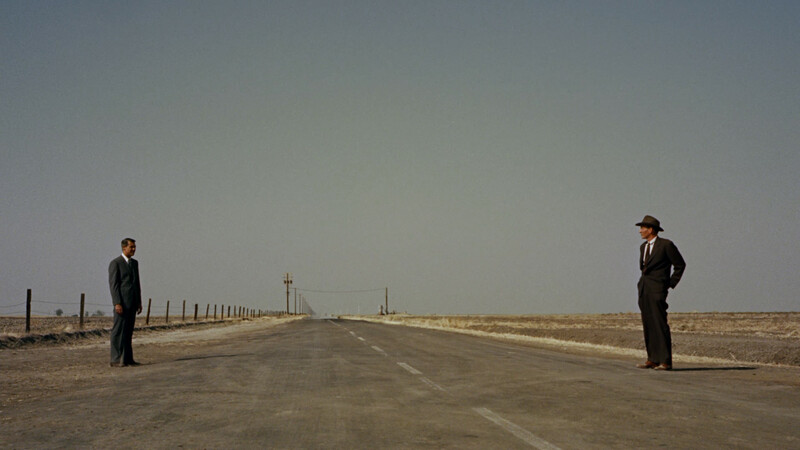 Having spent the first several minutes of the film exploring Roger's personal perspective as the main character, we get a taste of the overall story and things to come when Roger raises his hand at the wrong time - the story's perspective shifting briefly to the two, previously unassuming, men lurking in the background. Roger's desire to send a telegram to his mother is misconstrued, his hand raised giving the false perception to the two kidnappers trying to smoke the mysterious Kaplan out that he is their man. From this point on, the overall story's scope continually increases - along with the dramatic irony - as we're privy to the kidnappers' mistake. This leaves Roger confused and, due to the ensuing circumstances, with the desire to both clear his name and find out more about this George Kaplan he's been mistaken for. After surviving an attempt on his life, via drunk driving of all things, we're introduced to the biggest skeptic to Roger's story: his own mother. Her perspective of her son is less than favorable, leading to an instance of humor from dramatic irony when Roger and she find themselves in the same elevator as the kidnappers. The audience knows this, but Roger's skeptical mother doesn't - and his efforts to convince her result in her blurting incredulously for everyone to hear, "You two aren't really trying to kill my son, are you?" Not one to believe her son's story, Roger's mother doubtfully ask his would-be-killers if they're really trying to kill him. "Why, yes in fact we are!" isn't something one would expect these two to answer with, so they do the logical: laugh. 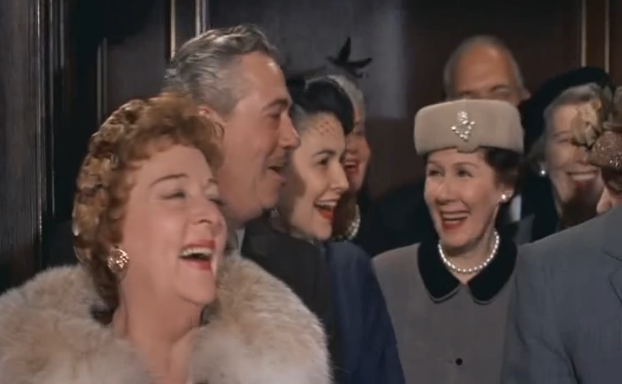 The kidnappers' laughter signals the absurdity of the notion, resulting in everyone else's own laughter. At the first act turn, Roger finds the real Lester Townsend, the man he believed responsible for kidnapping him, at the United Nations. This comes as a surprise to the audience who learns of this information at the same time Roger does - but from an objective story viewpoint, we see one of the kidnappers throw a knife into Townsend's back, killing him. Roger is caught "red-handed," so to speak with the bloody-knife by a photographer - the rest of the attendees given the false perception that Roger's guilty, thus sending him on the run. Caught in the act...of holding a knife. With a dead diplomat at his feet. Appearances - from varying perspectives - can be deceiving. Up until this point the story has only a sprinkling of objective events - focusing on more of Roger's perspective and easing him, and subsequently the audience, into the growing mystery from his point of view. We're very much in the dark just as he is with regards to who George Kaplan is and why he's a wanted man wanted dead. But that all changes when we're given a more detailed, objective view point from other characters within the overall story. Roger, being far removed from this storyline at this point, allows the story to shift focus as we're provided with the much needed information as to whom George Kaplan is and what's really going on which, in turn, raise the stakes. From this point, it's less a mystery now that the context of the story has been revealed, but the Hitchcock and his writer, Ernest Lehman, continue to milk dramatic irony for all that it is worth. 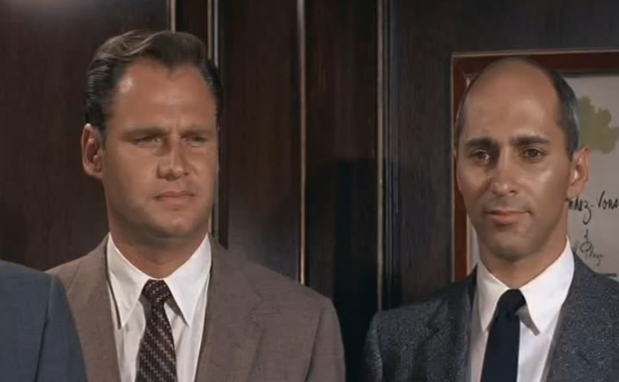 The masterminds behind "George Kaplan," the United States Intelligence Agency. "How can one be mistaken for George Kaplan when George Kaplan doesn't even exist?" George Kaplan, as it turns out, is a fictional character devised by US Intelligence to throw Phillip Vandamm, the real man responsible for Roger's kidnapping, off the scent of their very-much-alive agent working right underneath his nose. Furthermore, we learn that Roger's incidental involvement, though to his own detriment, has helped the cause and that the intelligence agency finds it best to let it play out without their involvement so as to not cause any uncertainty towards Kaplan's existence - otherwise their own agent may risk exposure and assassination. Roger, it seems, is on his own...until meeting a sympathetic blond on a train in the form of Eve Kendall. Eve, as it turns out, is the real agent who is never explicitly revealed until much later so most viewers not keen on story structure are less likely to suspect her as such. 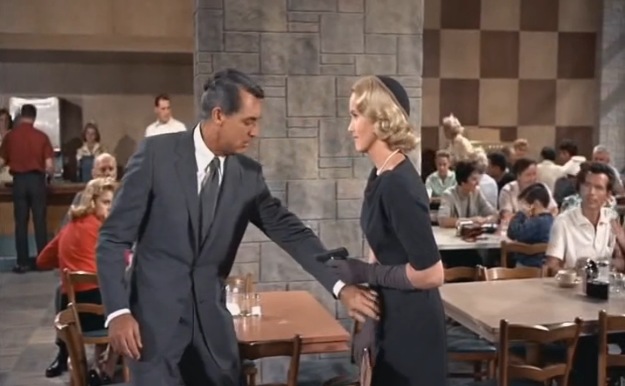 In fact, after she charms Roger - but before her role as an agent is revealed - the audience is given a major jolt of dramatic irony around the midpoint when she passes a note along to none other than Vandamm. 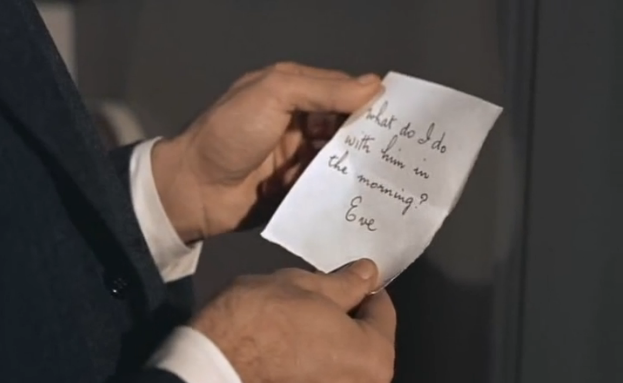 Eve's note to Vandamm spells trouble for Roger. At this point, the audience is lead to believe Eve's working on behalf of Vandamm, knowledge that is obviously unsuspected or known to Roger which sets up "the morning" and one of the more suspenseful sequences in motion pictures: the infamous crop-dusting scene. Given explicit instructions by Eve, Roger is to meet "Kaplan" at Prairie Stop on a highway, 3:30pm sharp. Although we don't know the specifics, Eve's alignment with Vandamm suggests it can't be good - this much we know for certain. What ensues is a nearly ten-minute exercise in suspense as Roger arrives on the lonely road only to be met with a series of red herrings, the suspense and tension growing with each one until a man standing opposite the road of him makes note the oddity that a crop-duster is dusting crops where there isn't any. Before long, the man disappears on a bus and Roger is alone...with the crop-duster barreling down and taking aim at him. That Eve would send Roger to such a fate only reiterates our assumptions of her alignment with Vandamm, but when her real function is ultimately revealed later, we can see how it's indicative of the US Intelligence's handling of the situation in order to protect her: she, just as much as they, are acting in self-preservation. That Roger would survive and show up to antagonize Vandamm at an auction with Eve herself present endangers the mission - and potentially her life - when Vandamm's henchman asks if Roger was in Eve's room, to which he replies, "Sure, isn't everyone?" Vandamm's gaze and slow withdrawal of his touch upon Eve, both unseen by Roger, suggests trouble for her as we may have began suspecting her playing an entirely different function by this point. But Roger, not knowing the truth, can't help but twist the knife of betrayal and taunts Vandamm by asking him how much he's paid for her, noting "She's worth every dollar, take it from me. She puts her heart into her work. In fact her whole body into it." It's only when the professor, head of the US Intelligence team, later informs Roger that Eve is their agent and his actions may have put her life in danger that he's fully able to understand the gravity of his actions. The moment Roger realized what the audience began to suspect some time ago: Eve's the agent working under Vandamm's nose, and Thornhill's actions inadvertently has put her life in danger. Seeking to help the professor save Eve, Roger agrees to a "hair-brained scheme" that occurs at the end of the second act, adding yet another layer of dramatic irony as his public "confrontation" with Eve in Vandamm's presence leads her to fire a blank shot at him. The professor, playing a bystander, is the first to check Roger, declaring him dead with a mere shake of his head while Vandamm's henchman bears witness to the confirmation. Shoot now and ask questions later, like "did it hurt when you fell?" Of course it's all an elaborate ruse in an attempt to clear Eve of any suspicion from Vandamm and sets up the suspenseful finale: the audience knows Eve still has to play her role and is scheduled to leave with Vandamm later that night, but wants to see Roger's desire to save her fulfilled despite that not being part of the plan. The problem: he's supposed to be dead. As a result of the dramatic irony - we know Roger is alive but Vandamm doesn't, nor does Eve realize Roger is there trying to save her. The stakes are fully known by the audience, privy to everything at this point, as we realize if Vandamm and his men see Roger, the ruse will not only be over, but Eve's life as well having been an accomplice to it which raises the question: how will Vandamm find out (it's dramatically inevitable) and what will happen when he does? 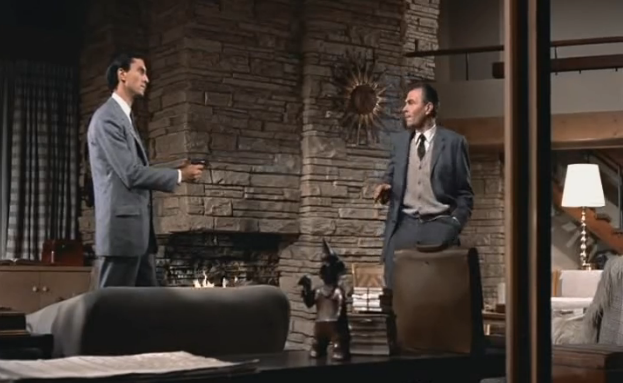 Leonard, played by Martin Landeau, discovers Eve's gun and proves his doubts to Vandamm (James Mason) while Roger looks on. As with any good set-up, the blank-shooting gun pays off as the means by which the scheme is ultimately discovered. This time, however, Roger is privy to this knowledge along with the audience, but Eve - whose life is at risk - is the one left in the dark. Now the dramatic irony twists the screws tighter yet again from Roger's perspective, begging the question: how will he alert Eve that Vandamm is onto her without being caught? Another set up, another pay off. ROT says it all. 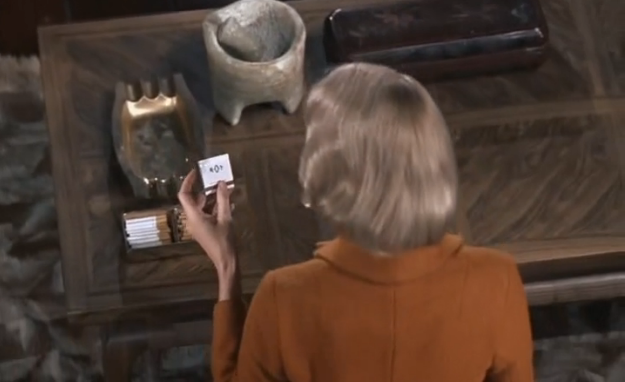 We know what it means, but Leonard doesn't as he finds the matchbook on the floor and casually drops it into the ashtray where Eve sees it - and Roger O Thornhill's message on the inside flap. 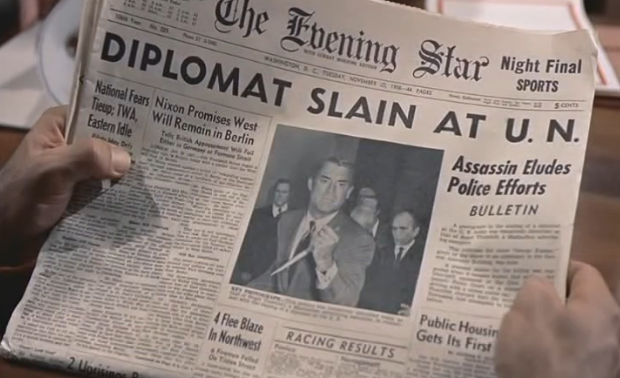 Perhaps Hitchcock's most entertaining film, North By Northwest remains so partly due to its usage of dramatic irony throughout its telling. Each of its act breaks, along with the midpoint, push the story into a new direction in a way that engages the audience by letting them know more information than the major players involved - creating questions in their minds as to what will happen next while keeping them in suspense through a series of set ups and pay offs. Understanding these various perspectives in a story will undoubtedly help one to master the art of its telling, specifically with regards to who knows what, when they know it and how they know it - with particular focus on audience reception to maximize their own involvement. More Wassup! On Film articles can be found here. Previous Previous post: Two elements each of these seminal horror movies since 1960 have in common, Part I.